At the ongoing VMworld 2018 conference in Las Vegas, AMD announced the Radeon Pro V340 dual-GPU for Virtual Desktop Infrastructure (VDI) applications. 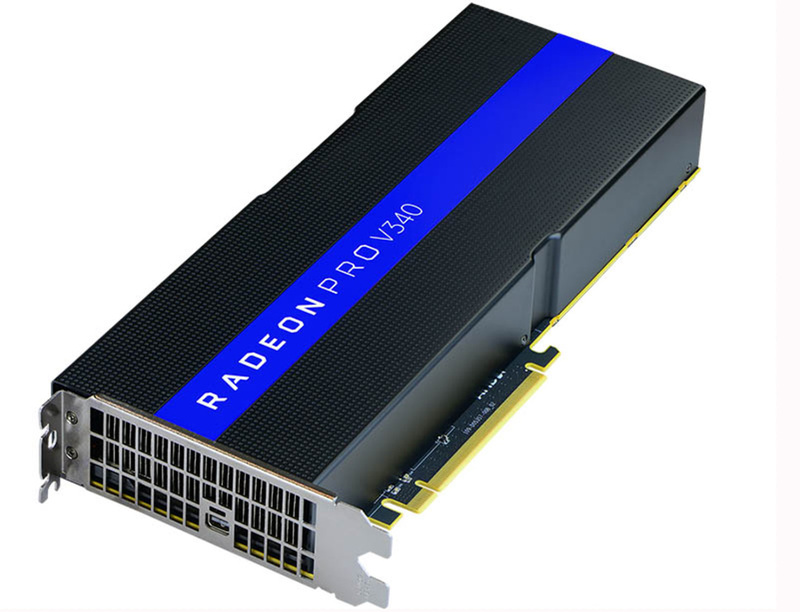 The Radeon Pro V340 can power demanding datacenter workloads such as CAD, rendering, and Desktop-as-a-Service (DaaS) applications. The V340 can support up to 32 VMs, each with its own independent memory access for extra security along with support for independently compressing H.264 and H.265 video streams. A few months ago, we reported about AMD's plans for the high-end datacenter market with the Radeon Pro V340. Now, AMD has made the V340 official at the VMworld conference yesterday in Las Vegas. The V340 is not your typical gaming or even a workstation GPU but one that is aimed at Virtual Desktop Infrastructure (VDI) environments. A VDI provides clients including desktops, thin clients, and mobile devices with a personalized desktop that mimics a local installation except that it resides in a datacenter. The Radeon Pro V340 is based on the Vega architecture and is a dual GPU solution made possible by AMD's MxGPU technology. It is still not the 7nm Vega that AMD showed off at Computex 2018, though. MxGPU works on SR-IOV that allows up to 16 virtualized users per physical GPU. Therefore, the dual Vega GPUs in the V340 can support up to 32 concurrent virtualized users. The V340 sports 32 GB HBM2 ECC memory with each user getting 1 GB memory for remotely running demanding workloads such as CAD simulations, rendering, and Desktop-as-a-Service (DaaS). AMD's MxGPU enables scalability without having to incur recurring hardware licensing fees and a datacenter can leverage as many such V340s as needed. AMD says its user density is 33% more than the competing Tesla P40 offering from NVIDIA that supports up to 24 concurrent users. Since the data doesn't reside on the client, a VDI setup is inherently secure and the V340 further augments this with a built-in security processor that provides secure boot and data encryption. Each connected client is isolated from the others at the hardware level. The GPU also can independently compress both H.264 and H.265 video for all the shared users. The exact GPU specifications, however, were not yet revealed. Pricing details were not revealed but AMD says that the Radeon Pro V340 can be expected to be available from Q4 2018 and those who wish to see the card in action can visit AMD booth #2501 at the VMworld 2018 venue. It remains to be seen if NVIDIA is planning for a Turing-based datacenter solution sometime later this year or early 2019. VMworld, <location value="LU/us.nv.lasveg" idsrc="xmltag.org" style="box-sizing: inherit;">LAS VEGAS</location>, <chron style="box-sizing: inherit;">Aug. 26, 2018</chron> (GLOBE NEWSWIRE) -- AMD (NASDAQ:AMD) today announced the Radeon™ Pro V340 graphics card, a high-performance dual-GPU Virtual Desktop Infrastructure (VDI) solution purpose-built to power and accelerate the most demanding datacenter visualization workloads, including CAD, design, Desktop as a Service (DaaS) and rendering. “As the flagship of our new Radeon™ Pro V-series product line, the Radeon™ Pro V340 graphics card employs advanced security features and helps to cost effectively deliver and accelerate modern visualization workloads from the datacenter,” said <person style="box-sizing: inherit;">Ogi Brkic</person>, general manager of Radeon Pro at AMD. “With increased density, faster frame buffer and enhanced security, the AMD Radeon™ Pro V340 graphics card delivers a powerful new choice for our customers to power their Citrix Workspace, even for the most demanding applications,” said <person style="box-sizing: inherit;">Calvin Hsu</person>, VP of Product Marketing at <org style="box-sizing: inherit;">Citrix</org>. The AMD Radeon™ Pro V340 graphics card is expected to be available in Q4 2018 from leading system providers. Visit the AMD booth #2501 at VMworld in <location value="LU/us.nv.lasveg" idsrc="xmltag.org" style="box-sizing: inherit;">Las Vegas</location> to see the new solution in action. ©2018 <org value="AMD" idsrc="xmltag.org" style="box-sizing: inherit;">Advanced Micro Devices</org>, Inc. All rights reserved. AMD, the AMD Arrow logo, Radeon, and combinations thereof are trademarks of <org value="AMD" idsrc="xmltag.org" style="box-sizing: inherit;">Advanced Micro Devices, Inc.</org> OpenGL® and the oval logo are trademarks or registered trademarks of <org style="box-sizing: inherit;">Hewlett Packard Enterprise</org> in <location value="LC/us;LB/nam" idsrc="xmltag.org" style="box-sizing: inherit;">the United States</location> and/or other countries worldwide. DirectX® is a registered trademark of <org style="box-sizing: inherit;">Microsoft Corporation</org> in the US and other jurisdictions. OpenCL™ is a trademark of <org style="box-sizing: inherit;">Apple Inc.</org> used by permission by <org style="box-sizing: inherit;">Khronos Group, Inc.</org> Other product names used in this publication are for identification purposes only and may be trademarks of their respective companies.